Particular attention has been paid to pedestrian areas and public places. Riviera Park has become one of the most convenient places where people with disabilities can spend their leisure time. The park is situated in the center of Sochi, and has a tactile mnemonic map, through which people with impaired vision can obtain, through touch, all necessary information about the location of parks, cafes, and entertainment centers. Thus, they can plan their walking routes in the park. Tactile tiles have been laid on pedestrian lanes, helping people with disabilities detect obstacles and turns on their path. For wheelchair users, special ATMs were installed in the Riviera. Benches and litter boxes have been removed from the central walking lanes, which in the past, hindered easy movement. Each café has access ramps and low counters. International barrier-free environment requirements have also been taken into account in the Riviera Dolphinarium . This facility has a special elevator for wheelchair users, and inside there is a separate spectator tier, specially designed for people with disabilities. A shuffleboard court was also constructed in the park. Recently, people with limited mobility have been provided with the possibility of moving freely around the city and using public transportation. 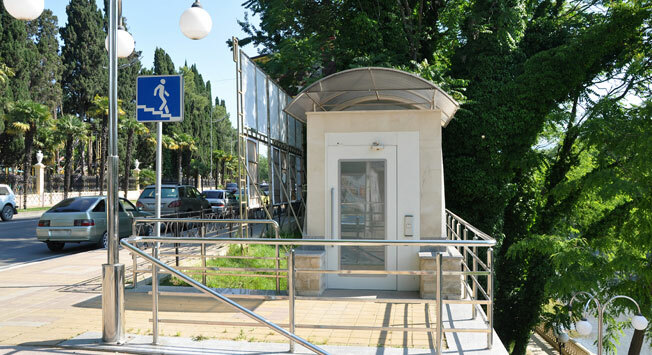 All major streets, sidewalks, intersections and stopping pavilions of Sochi and Adler have been lowered or modified to allow easy movement, and many kilometers of tactile tiles have been laid for the visually impaired. This transformation was first carried out on Kurortniy Prospect in the center of Sochi, 50 Years of the USSR Street in Khosta, Mira Street in Adler, Defenders of the Caucasus Street in Krasnaya Polyana. There are special lifting devices in the city’s underground passageways, and aboveground walking paths are equipped with audio traffic lights, which inform about the beginning of movement and countdowns in seconds. On urban routes, there are large buses, carrying passengers to Olympic venues. These buses have special ramps for wheelchair users mounted inside the cabin, and call buttons on the external side of the bus. All drivers of these vehicles have been specially instructed in the proper ways to assist disabled people. For people with disabilities that use personal vehicles, all the parking areas in Sochi have special spaces designated for disabled drivers. Most of the hotels in Sochi are ready to receive tourists with disabilities; they have special lifts, tactile Braille signage and low reception lobby counters. The rooms have all the necessary facilities for a comfortable stay for people with disabilities. They have bathrooms and toilets with wide aisles and special handrails. The furniture has been arranged so that wheelchairs can easily move to the balconies. The following hotels are designated as “barrier-free”: Marins Park Hotel, Radisson SAS Lazurnaya, Radisson Blue, Peak Hotel, Sochi Plaza Hoteland other large hotels and mini-hotels of Sochi. Unobstructed access points for people with disabilities were also created in many major shopping centers, small grocery stores and service establishments in Sochi. Today, the city has dozens of restaurants and cafes, which have rebuilt their ceremonial and interior premises in preparation for the arrival of participants and guests of the Paralympic Games. Now, many restaurants in the center of Sochi have been remodeled as well: McDonald’s on Kurortniy Prospect, White Nights cafe on Ordzhonikidze Street, Mama Roza Pizzeria on Moskovskaya Street, Trapeznaya Cafeteria on Roz Street, Del Mar Café on Navaginsky Street. In Sochi, many main cultural institutions can be visited by people with disabilities: Winter Theater, Organ and Chamber Music Hall, Art Museum, City History Museumand many other objects that can be included in this list. Among other things, the website sochibezbarierov.ru has been created, where it is possible to find the addresses of all barrier-free facilities, recreation and travel areas. Also listed here are beaches, hair salons, healthcare centers, banks, laundromats, office buildings, etc.